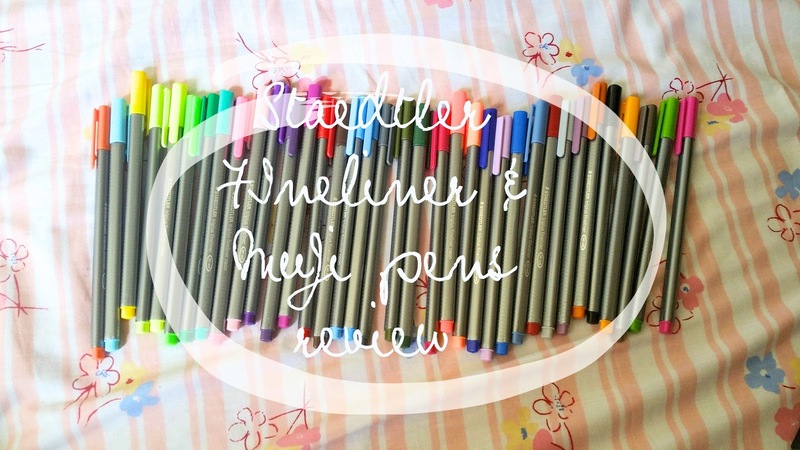 I first heard of Staedtler and Muji through tumblr study posts. But never cared to try them. 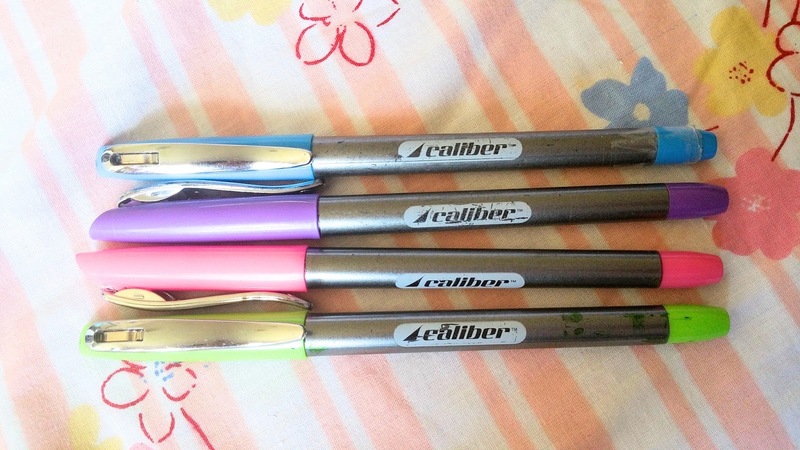 I was quite satisfied with my Zebra Sarasa pens (which I will be repurchasing in December and reviewing!). These pens are hyped on tumblr and seem good, so I bought them just out of curiosity. STAEDTLER TRIPLUS FINELINER pens are nice, I bought the 36 color pack and found most useless at first. Especially the pastel and neon colors. But I finally found a use for them! 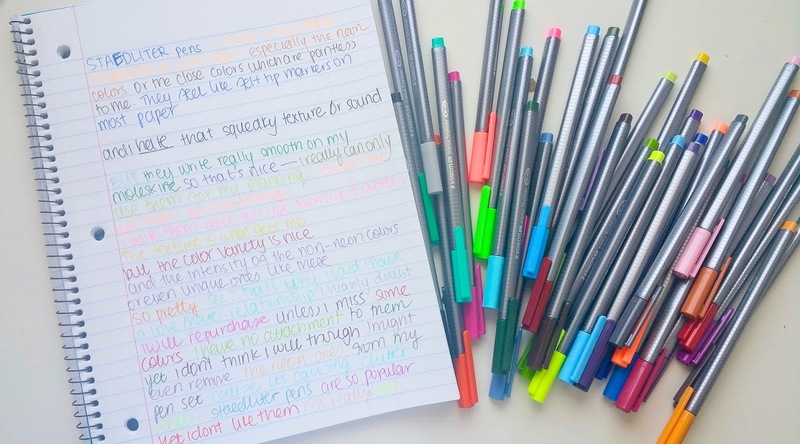 I use them to underline when I am reading, I prefer them to highlighters cause they do not bleed through pages. 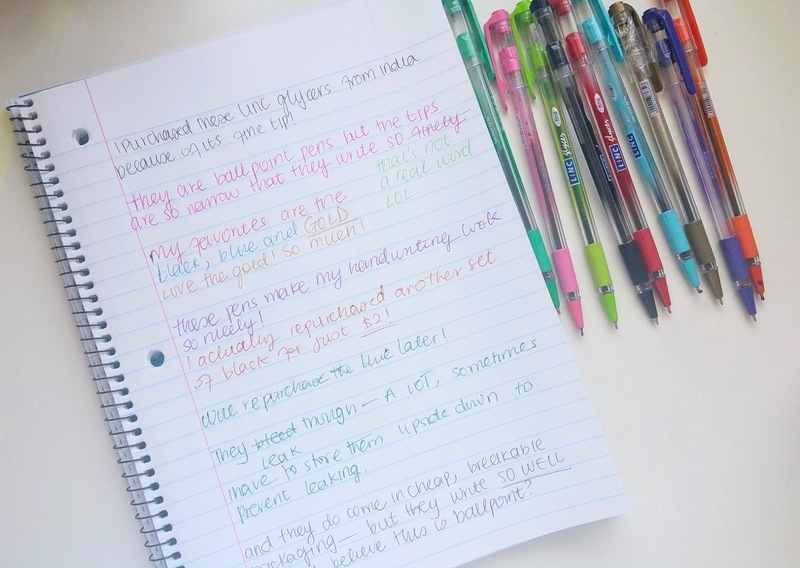 I did not like how squeaky they felt at first use but after continuous use, they became easy to write with. 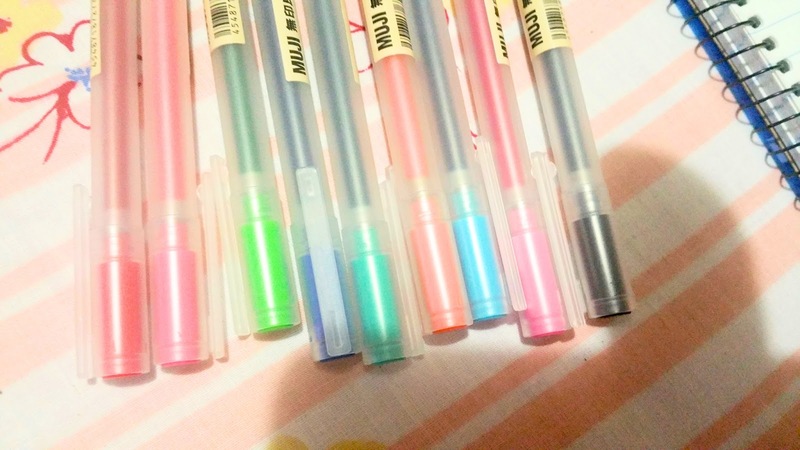 I even repurchased the black ones (a pack of 6), especially for my bullet journal. My only problem is when I leave it uncapped, it leaks on my bed. Although at my first use I said I won't repurchase, I think I will now: however I most likely would only get some specific colors. 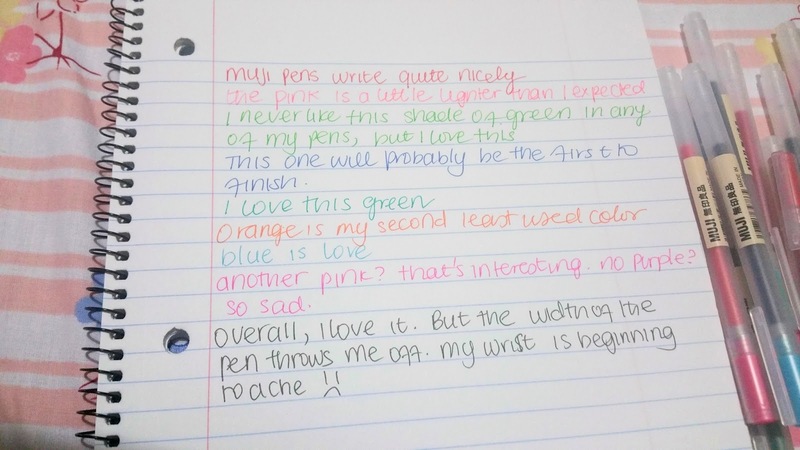 I judge my pens based on how easily I can write with it, how long I can write with it and how nice it makes my handwriting look. I actually prefer my ballpoint pens to fine ink pens because they write easily and don't hurt when I use them. 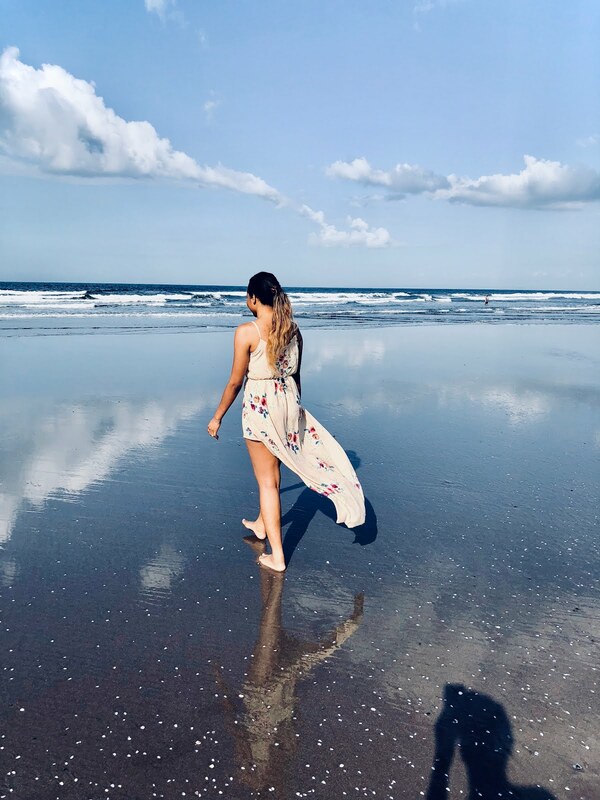 I write a lot, for very long periods of time (about 3-5hours at a time). In my opinion, MUJI GEL INK BALLPOINT PENS 0.5MM is overhyped. I like them, they write nicely and don't leak on the page compared to pilot G-2s but they are chubby and can be hard to use for a long time. (although lately, I have not noticed the size-so I think I got used to it). The only other problem that will prevent me from repurchasing the set again is that at 2 different occasions, to my green and my orange the ink leaked from the tube all the way to the top and the cover and the tip, and just keeps leaking with no fix. Even after cleaning it up and sealing everything, it keeps leaking. If I do repurchase, it will be only black and blue colors. I love them. LINC GLYCER BALL POINT PENS are one of the very underhyped, cheap nice pens that every ballpoint pen lover must get. 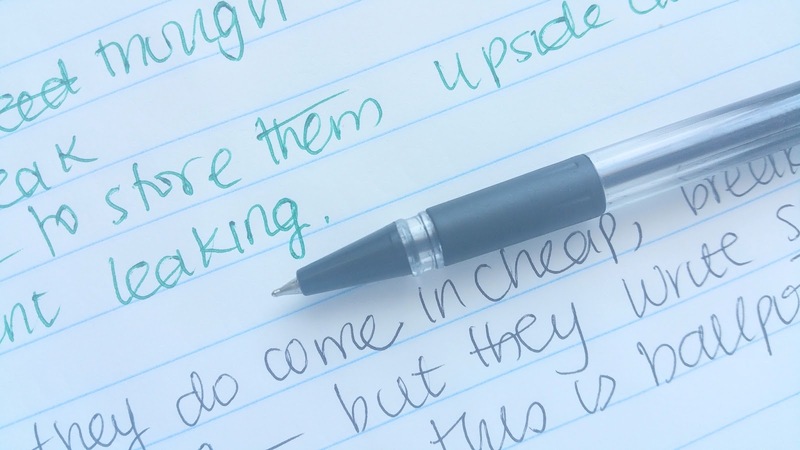 These pens may be ballpoint, but they are so fine, the write REALLY nicely. They are very cheap! ($5.85 on amazon). I also love the color variety, the gold is my favorite! Because they are cheap, they do leak, I have to store them upside down and the packaging is so cheap it tends to break apart if one is not careful with them. 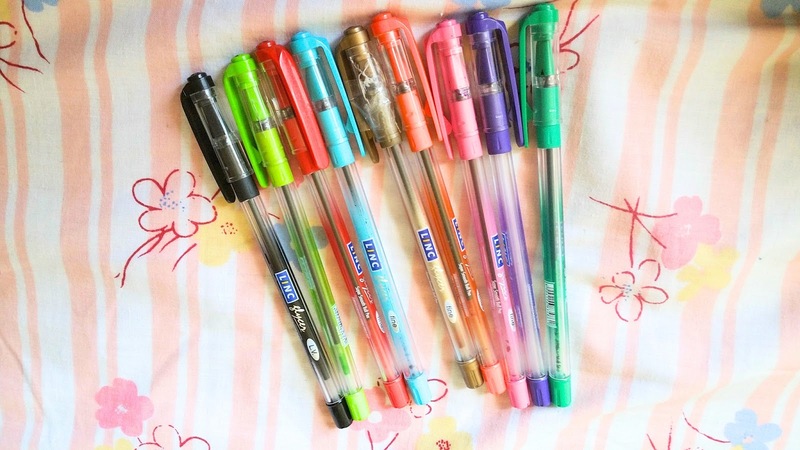 However, I will repurchase them all because it is cheap and really writes nicely, and my hands do not hurt so I can write with them for very long periods of time. CALIBER SUPERGLIDE BALLPOINT PENS are some random pens I found in CVS, (not sure if it is exclusively sold there- they can be found in staples). I purchased it years ago, but now there are other colors like black and blue in the gel form!! I must get my hands on those! They remind me of bic crystals without the excessive leaking and with a much more comfortable grip, but the packaging is so cheap you notice in the picture I had to tape the cap. 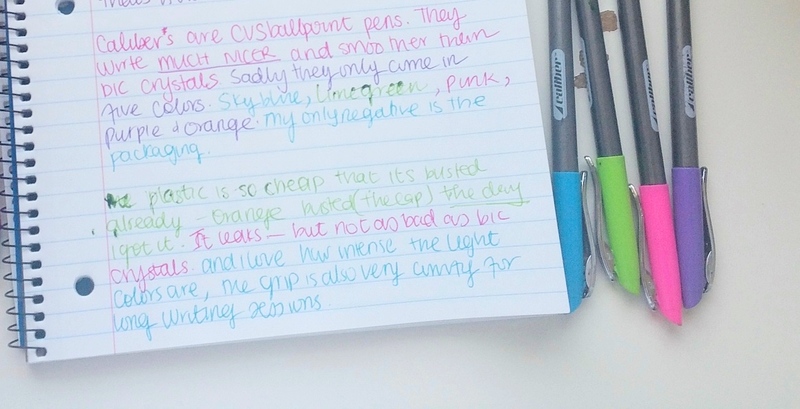 I will still repurchase because it does its job and it fits my criteria for a good pen.